In six seasons with the Rhinos Liam has made 139 appearances and scored 590 points for the club. In 2019 he represented England Knights and got his first England cap in the game against France. 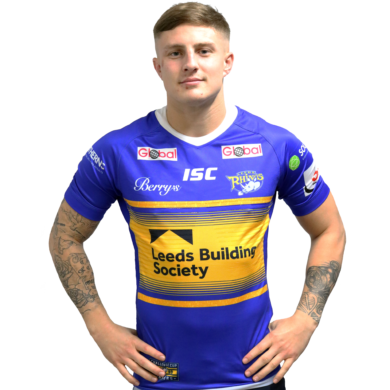 The Leeds born player emerged from the Rhinos Academy to make his first team debut in 2013. In his second season he made 26 appearances and registered 11 tries and eight goals and won his first piece of silverware as part of the team who won the Challenge Cup against Castleford. The season was also memorable for a crucial kick, when he stood in for Kevin Sinfield on kicking duty and scored a dramatic last-minute penalty to secure a win over Catalans Dragons. He made 11 appearances for the Rhinos during the 2015 treble winning season and was in excellent form, kicking 25 goals and scoring four tries, before a knee injury against Hull FC brought his season to a premature end. In 2017 he was named in the Grand Final side and won his first Super League title with victory over Castleford Tigers. He previously played for Hunslet Warriors, who he won the Yorkshire League with and has represented Yorkshire, England Under-16s and England Youth in 2011. In 2012 he scored nine tries in 11 appearances for the Rhinos Under 18s and scored a try for the Under- 20s, whom he featured five times for. He was named captain of the Under-19s at the start of the 2013 season and was an ever present for them before making his first team debut against St Helens and going on to make 18 appearances and score seven tries. He continued his commitments to the first team throughout the 2013 season and less than 24 hours after playing in the first team’s Play Off Final defeat to Wigan he pulled on his shirt again to play in the Under 19s Grand Final. He was rewarded for his superb debut season by being voted the Yorkshire Evening Post Shooting Star award and earned a new long-term contract with the club. MTech have the experience, the skill and the passion to improve and help grow your business. We collaborate closely with you and the people within your business to ensure that, whatever problems or dilemmas come your way, IT is not one of them. We are passionate that a great IT & Network infrastructure should go un-noticed and improve, not impede, the growth and productivity of your business.